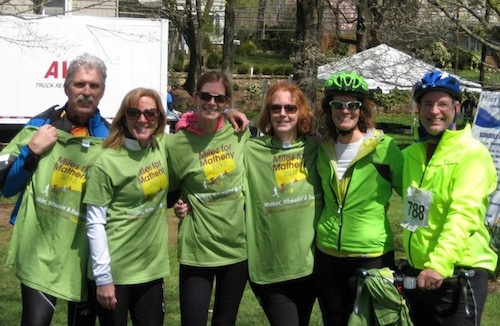 Fat Bottom Girls cycling group from last year’s Miles for Matheny. From left, David and Fran Graham, Bethlehem Twp., NJ; Nora Godown, Chester, NJ; Jill Reuter, Nazareth, PA; Meg and Steve Slutter, Clinton Twp., NJ. Jill, Nora and Meg are sisters. This year, the Fat Bottom Girls have formed a team page on the Miles for Matheny website, with a fundraising goal of $2,000. All funds raised at Miles for Matheny help support the Matheny Center of Medicine and Dentistry, where more than 800 of New Jersey’s teens and adults with developmental and intellectual disabilities have access to the best medical, dental and therapy care possible. Peapack-Gladstone Bank is the cycling sponsor. Other major sponsors are the Poses Family Foundation, the Golub family, Partlow Insurance, Porzio Bromberg & Newman PC Attorneys at Law, BP Fueling Communities, Delta Dental of New Jersey, Inc., WCBS-TV and WCBS Newsradio 880. For more information about Miles for Matheny, log onto www.milesformatheny.org or call (908) 234-0011, ext. 260. To help support the Fat Bottom Girls, log onto http://www.milesformatheny.org/fatbottomgirls. This entry was posted in Uncategorized and tagged biking, Fat Bottom Girls, Miles for Matheny. Bookmark the permalink.